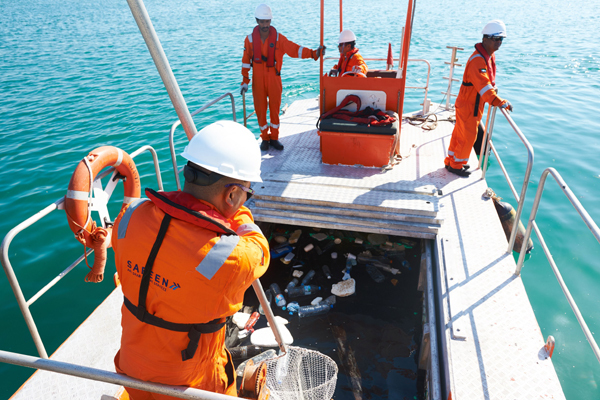 Abu Dhabi Marine Services (Safeen), a leading provider of integrated marine services in the Middle East and subsidiary of Abu Dhabi Ports, has collected over 120 tonnes of floating sea debris in Abu Dhabi waters last year, recycling more than ten tonnes of the collected material. “The department, run by Emirati staff trained to the highest international standards, has designed a special boat which was responsible for the collection of tonnes of floating debris, such as plastic, wood, ropes and fishing nets in Abu Dhabi waters,” he said. “In addition, the department coordinates joint actions with all parties involved in protecting the environment and the marine life, particularly coral and sea turtles, and organises awareness campaigns about the hazards of throwing waste in the sea,” Banihammad added. “We are committed to the continuous improvement, efficiency and performance of the department by running periodical training and drills to ensure the readiness of staff and equipment at all times,” he concluded. Safeen has all the resources and tools needed for treating and containing level-one oil spills according to the criteria of the International Petroleum Industry Environmental Conservation Association (IPIECA).